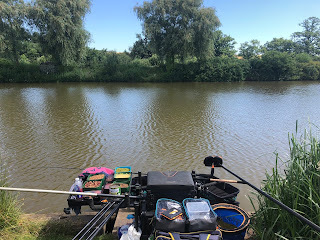 Day 2 on the pairs, after a night in the pub with the lads trying new drinks such as double vodka and strawberry slushies it was back to a day in the lovely Leicester sunshine and the Glebe Fishery. reckon its about a 1 in 1152! Maybe I should get a lottery ticket on the way home! 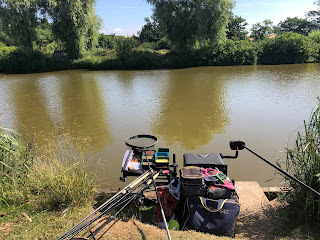 After my blow out yesterday and trying to keep things simple I decided to try the same approach as 2 weeks ago again, so feeder to the far bank, pellet waggler for the cruising fish, 5 metre pole line and left and right hand margin lines. 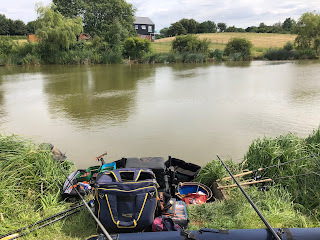 Two weeks after my last two day pairs event at the Glebe and I find myself with the Facebook Angling League (FAL) lads for another two day pairs event. Hopefully I'd learnt from that match earlier and I had a match plan to keep things simple. Random draw for your pairs partner, FishyPhil was this weekends unlucky victim. I would be drawing on Pool 1 for today's match. Home for the day would be peg 2. I drew this peg 2 weeks ago, what are the odds of that? Well with 48 anglers, I'd hazard a guess at 1 in 48! A small change to the plan from the previous weeks effort. 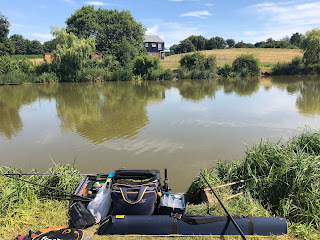 I set-up a feeder line to target the area between the fair reeds which would double as my bomb and pellet line, together with a pellet waggler. Pole lines at 5 metres and both my left and right hand margin. I'd cut down the bait menu to pellets, corn and some dead reds together with a bucket full of groundbait.